Alicia Marie Sacramone (born 3 Dec 1987 in Boston, Massachusetts), is a retired American artistic gymnast who won the 2008 Olympic silver medal in the team all-around. 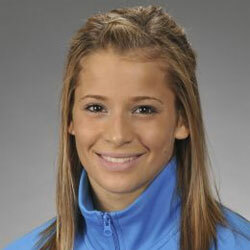 She is the secord most decorated U.S. gymnast with ten World Championship medals. In 2009 Alicia designed Tank Farm, a men's fashion company. She signed with CoverGirl in 2008 and was the face of Gatorade (2009). From CoverGirl: "Shawn, Nastia and Alicia are wonderful additions to the CoverGirl family, representing CoverGirl ideals of both inner and outer beauty," said Esi Eggleston Bracey, Vice President and General Manager, CoverGirl Cosmetics in North America. "We want to honor their confidence and help them shine in the spotlight. We are thrilled they are lending their beautiful faces to CoverGirl."